Top 10 Android 4.4 KitKat Features! 10. 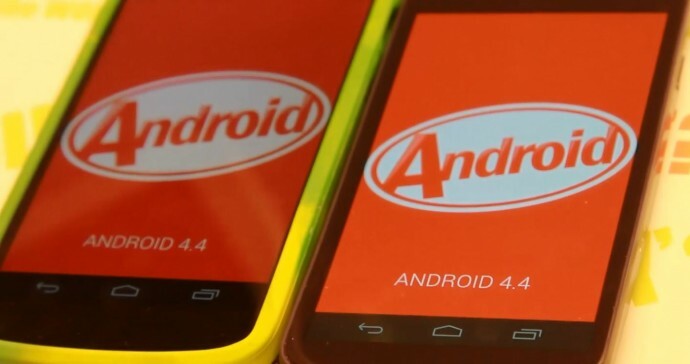 KitKat Android 4.4 has been designed to run fast and smooth on older devices even ones with only 512MB of RAM. This means KitKat is going to improve performance on your older Android devices such as Galaxy Nexus, Nexus One, HTC Evo, etc…etc… While those older devices might not get official updates, you can get KitKat by rooting and installing a ported custom ROM. This is great news for those of you still with an older Android device, Google is simply offering more optimized OS that can work on any Android device regardless of its raw CPU power. And this will be great for future smartwatches and smart glasses. 9. KitKat Android 4.4 now supports voice commands out of the box when your phone is ON. All you have to say is, “Ok Google” and give your phone commands. 8. SMS/MMS is now integrated with your Hangouts app. Now when you receive an SMS or MMS message, you will get it right in your Hangouts inbox, this can save you a bunch of money on text messages if you use along with Google Voice like I do, you will pay $0 in texting fees from your carrier nevermind the fact that you can also check your SMS/MMS when not on your phone. 7. With KitKat, you will now be able to print straight from your phone. You will have to sign up for Google Cloud Print/HP ePrint, but once signed up, just print straight from your Android device. 6. QuickOffice is now included as part of regular Google Apps starting with KitKat Android 4.4. This means you can quickly and easily open your online Google Docs or offline Microsoft documents with ease and edit them. 5. Contacts are now Prioritized with Android 4.4. KitKat. Your phone will quickly recognize the phone number you call the most and show up first on your contacts main screen. 4. KitKat brings you enhanced Caller ID. When there’s no caller ID from the caller, Google will search its own search results and find a caller ID related with the number. This will be handy when banks call you from the mid-west, I would find this new feature handy if Caller ID listed it as bank so I don’t have to pick up calls from telemarketers. 3. Now your album or movie cover art will be used automatically as background for your lockscreen. This will work great for listening to music on Pandora or watching movies through ChromeCast. 1. Tap & Pay – You can choose which app to use for NFC payment such as Google Wallet. Overall, KitKat is the latest and greatest from the people at Mountain View, California that offer a better memory management system with reduced memory footprint, meaning better overall performance of your Android device in the long term. For those of you looking to upgrade to KitKat, simply wait for it if you have any of the newer devices or you can also root and install a custom ROM if there’s one available for your device. Hope they port for galaxy note i717 soon can’t wait to try it. I did tried to install it on my phone from one of the site and kind of messed my phone and had to unroot and re-root my phone. Now it working find so far running Liquid Smooth. Battery life is not so great. any idea if there shall be an update for the galaxy tab 10.1 p7510, or any compatible ROM? i have one and hope it gets snappy with 4.4! Is wifi direct working in this rom? If I get OTA 4.4 update on Sprint Note 2 can I then root and install Macks All Star v5? I have tmobile galaxy s4 ,,,other day rooted with google rom and it crashed and burned the phone it loaded and everything failed, then i triedhe rest and phone did go to boot loop ,,,so did exchange id like to know what i did wrong why it failed it looked so cool the google edition rom,,, phones been wiped so hopefully i wont have to pay guarentee but prob will not a newbi to modding phones,,, just this one lol I do have red writing ontop of logo screen which i cant read would land google battery signal instead of the tmobile,,, how can i completely wipe those two last features ? Next story Nexus 5 Unboxing! Previous story Google Glass Review and See-Through Demo!